I was short bias going into the morning.....even though everything was screaming long. I had 4 trades, 3 short and one long. 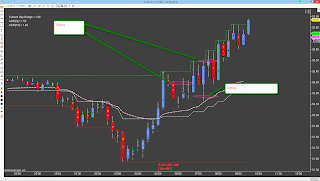 Two of the short trades stopped out for -.125RR and one at -.25RR and the winner was a 3RR trade. 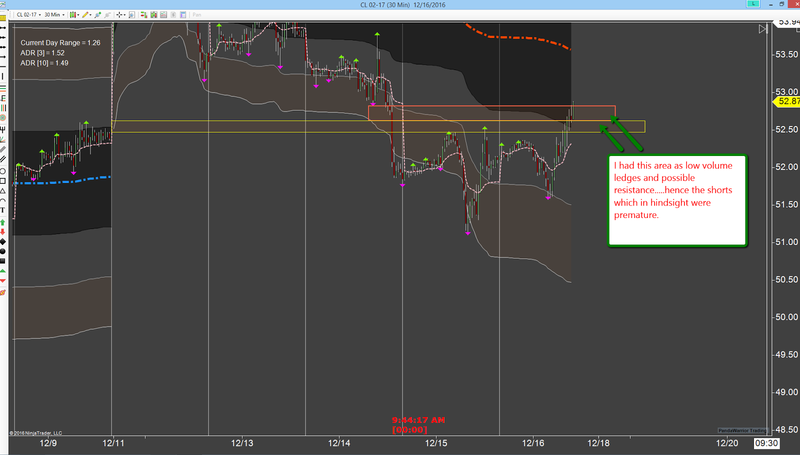 If I had held the third short at -.125RR and kept the long winner, would have been a slightly positive day. That said, I'm happy with the net result for the week. Nearly 3RR after a month of doing nothing but losing every day. I'm not back to even for the year but close. I might extend my trading into next week and see if I can get the account to even on the year and prepare for next year. I'll chat with my wife about this and see what she says. She's super supportive of my trading and I try to include her in some of the strategic decisions. I think I got the areas correct for the short but targets were misplaced. I was looking for these trades to pull back to VWAP. Was greedy with those. Almost all the shorts went my way at least ten ticks but when you are on the wrong side of the market, it doesn't matter. You are going to get stopped out. You can see on the 30M chart why I was thinking short. It was a valid premise I think, just premature. Once price was NOT rejected firmly at that first resistance level, I should have really switched long for good but I didn't. Most things went right this week. Some didn't. The most important thing though was my mind was right. I got my emotions mostly in line with my ambition and was able to wait for appropriate levels to trade and more importantly, wait for my 3RR targets to be met. There were several missed opportunities to be sure. But for now, I am working on making sure I do the right things over and over again. It's more important to have process and rules based wins than to win big dollars at this point. Keeping the losers tiny and letting the winners actually work out made a huge difference this week. I did add to one trade successfully and added to a couple others unsuccessfully. Those were small losers or scratches. The one thing that did go wrong this week was I did choke off a couple of trades that were eventual 3RR winners at BE. Its a curse but it seems to crop up when I am most unsure of the trade premise. Going forward, I can reduce this by being better prepared, have solid trade premise ideas and commit to those fully.